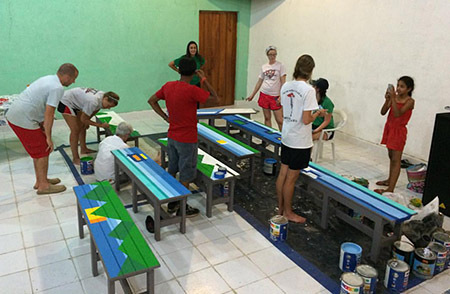 The benches are coming to life here in Rio Blanco! Another beautiful day here in Rio Blanco, Matagalpa working with the community and the people of the Verbo Church through Connect Nicaragua. Over the last few days we have all experienced so many powerful moments together and the eight benches are coming to life! Our entire team along with kids and adults from the community have been painting away!